To navigate to the private offer page, either follow the link that the product vendor sent you or navigate to the product's page in AWS Marketplace. The panes and configuration options available for a SaaS private offer depend on the contract that you negotiate. 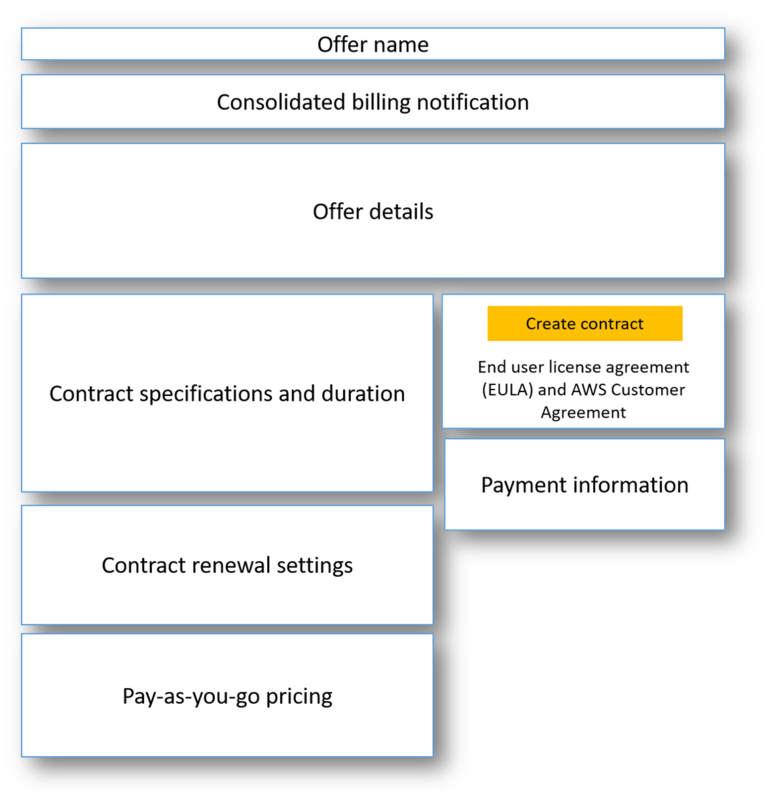 The following image shows the private offer page layout and brief description of each of the areas that you might negotiate with the product vendor. This is the name that the product vendor gave your private offer when they created it. This notification appears if you're using consolidated billing with your AWS accounts. If you have one or more offers for this product, they appear here. Additional information includes the product vendor name, offer ID, and offer expiration date. The offer expiration date is how long the offer is valid for. If you don't accept the offer by the expiration date, the offer is no longer available to you. This pane shows the duration of the offer and the dimensions that define the offer. The dimensions describe how the usage is measured and the duration how long the negotiated pricing is in effect: for example, 5 GB/day for 12 months or $0.01 per user per hour. If the private offer is a contract, you pay for an agreed-to amount of usage over the duration of the contract. If the private offer is a subscription, you pay for your measured usage at the agreed-to rate. You can't set private offers to be renewed automatically. For private offers on SaaS products, this pane always indicates that there is no renewal for this offer. If you negotiate pricing for product usage beyond what is defined in your private offer, the specifications for how much additional usage costs appear here. For example, if you agreed to a SaaS contract for data storage of 5 GB/day for 12 months and you use 10 GB/day, the first 5 GB fall under the contract. The additional 5 GB/day are charged at the pay-as-you-go price. With SaaS subscriptions, you have an agreed-to rate for however much you use during the duration of your contract. This is where you can view the license agreement that the product vendor uploaded for this private offer. This is also where you accept the contract after you have viewed all of the private offer specifications and are ready to enter into the contract. This pane describes when payment is due and, if you negotiated a payment schedule, the date and times when payment is due. Any pane that doesn't appear isn't a negotiated part of the private offer. In the offer details pane, verify that you choose the correct private offer. You might have multiple offers for the product. In the contract specification and duration pane, verify that the contract duration and contract details are what you negotiated. If not, verify that you have selected the correct private offer or contact the vendor who created the offer. If you negotiated pay-as-you-go pricing, there should be a pane with information that describes the terms that you negotiated. Verify the information, or if it's missing (and you expect it), contact the product vendor. In the payment information pane, verify the payment information. If you negotiated a flexible payment schedule, the payment dates and amounts are listed. If you didn't, the total amount of the contract is billed when you accept the offer. In the EULA and contract creation pane, validate that the EULA is the one you negotiated with the product vendor. After you review all of the terms and conditions for the contract, choose Create contract to accept the offer. After you accept the offer, a conformation page opens, indicating that you successfully subscribed to the product. Choose Set Up Your Account to be redirected to the product vendor's page and finish configuring your account on the vendor's website.